Community Aggregate Payment (CAP) Levy was introduced January 1, 2006 as a means to provide communities a visible and tangible benefit for local aggregate operations. Under the Municipal Government Act, municipalities have the ability to pass a Community Aggregate Payment (CAP) bylaw that requires operators to report shipments based on tonnage, and pay a levy of up to the regulated maximum rate of $0.40 per tonne of sand and gravel extracted. The CAP Levy has been adopted by approximately half of the municipalities in the province, and by the end of 2017, industry will have contributed some $88.4M to municipalities as a direct result this program. 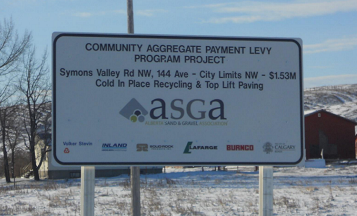 Alberta's Community Aggregate Payment Levy has been in place since January 1, 2006 and is set to expire on December 31, 2022. As government reviews the CAP Program and Regulation, the Alberta Sand and Gravel Association is advocating for a return to the original goals established at the onset of the initiative. The intent was to demonstrate the value of sand and gravel operations to local communities, and decrease public opposition. Currently, the general public remains largely unaware of contributions being made under CAP, as most of the monies collected by municipalities are directed into general revenues. When municipalities allocate these funds to their general revenue budget, the monies are typically not earmarked for a specific identifiable project, and are instead expended as part of normal operations. When direct community benefits are not visible to the public, opposition to development increases, and municipal permitting requirements become more stringent. This results in elevated costs for industry to develop new gravel reserves. This long term trend has meant that industry costs continue to climb. As a result, more and more projects are becoming economically non-viable and valuable resources are being left undeveloped. The ASGA believes the original goal of the CAP levy program remains relevant. By advocating for a return to the original intent, the Alberta Sand and Gravel Association would like to see a process where monies are allocated to a specific and identifiable project benefiting the community receiving the funds. For example, a playground, park, or other community project would allow a clear connection between industry and the benefits it is providing to the area. We would also like to see CAP become a provincial requirement with collection and disbursement of CAP Levy monies by a central, arm's length entity, and the removal of current exemptions. Finally, we recommend consideration for a percentage of CAP funds being allocated to research reclamation techniques and reclaim orphaned and abandoned sites. These proposals, reflecting the position of the Alberta Sand and Gravel Association, have been shared with Alberta Municipal Affairs and relevant stakeholders.